This page lists information of General and Historical Interest. There are additional items available from the pull down menu. “The streets were made for cars,” David W. McGill, deputy chief and patrol/traffic division commander of the Newport Beach Police Department 10/28/12. The cycling community is rich in history with a proud heritage that advocated for better roads and bike-ways since before cars were invented, and still does to this day, despite the viewpoints of people like the above who have a badge and a gun, so we won’t argue his “facts”, but supply a few noteworthy items of interest. Before there were cars, and in quite a few places before there were streets, there were bikes. Click Picture to read article about cyclists protesting for better roads in 1896! Bike riders in Newport Beach, California riding in remembrance and raising funds for increased safety for cyclists in 2012, continuing a tradition from the 1880s. A video of the event by Mario Rivera may be seen here. 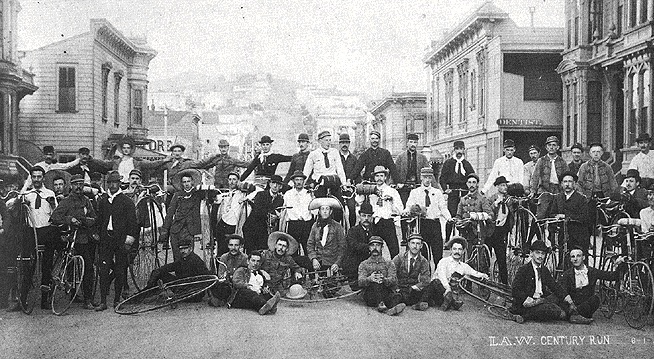 A great perspective of the current and past cycling scene in the San Fransisco area is here. Read about the development of the bicycle from the mid 1770s, bicycles from the mid-1800s, and the first electric cars with regenerative abilities from 1899 here. In 1865 bicycle bells were being made by Bevin Brothers in East Hampton, Connecticut. In 1880 the League of American Wheelmen (now the League of American Bicyclists) was formed in Newport, Rhode Island advocating for paved roads and cyclist rights in the face of antagonism from horsemen, wagon drivers, and pedestrians. Membership grew to over 100,000 members by 1898 including two Wright brothers that saw nothing wrong about inventing a flying machine from their bicycle shop. The first man to circle the earth by bike was Thomas Stevens from 1884 to 1886. Read about two Americans who set sail in 1890 and completed their cycle powered circumnavigation 3 years later here. Of local note in their remarkable journey, are local two clubs they visited, that are still active today; the Los Angeles Wheelmen, and the Riverside Local Wheelmen (now known as the Riverside Bicycle Club. Click Picture to read about the first US Bike Path. The mysterious disappearance of American cyclist Frank Lenz on his attempt to ride around the world in 1894. The first woman to circle the earth with a bike was Annie “Londonderry” Cohen Kopchovsky completing the adventure in 15 months in 1895. The current record (2012) for riding around the world is 92 days, or 3 months! Tales of Inspiration – Local People who made cycling better for everyone.